The Detective Jack Stratton Mystery-Thriller series has over 5,000 five-star reviews and over one million readers and counting. If you love a page-turning story with mystery, humor, and a dash of romance, pick up the latest novel and start reading today! A hometown hero with a heart of gold, Jack Stratton was raised in a whorehouse by his prostitute mother. When his foster mother asks him to look into a missing girl’s disappearance, Jack quickly gets drawn into a baffling mystery. As Jack digs deeper, everyone becomes a suspect— including himself. Caught between the criminals and the cops, can Jack discover the truth in time to save the girl? Or will he become the next victim? Police Officer Jack Stratton is hiding. Hiding from the world. From pain. From the memories of losing his best friend, Chandler, in Iraq. Suffering from PTSD, and isolated from those he cares about, the last thing Jack expects to hear is that Chandler’s sister is missing. The police think she just took off, but Jack knows Michelle would never leave behind those she loved—like he did. Now Jack must take action, find Michelle, and bring her home... or die trying. 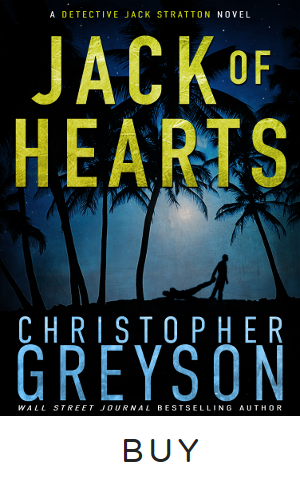 Jack Stratton is the “hometown hero cop with a heart of gold.” Constant nightmares have forced him to seek answers about his rough childhood and the dark secrets hidden there. With Replacement by his side, Jack travels to Hope Falls to solve a murder that occurred before he was born. Everyone in the small town remembers the unsolved murder of Steven Ritter, but after 27 years, no one thought that someone would look into it—but they don’t know Jack. Jack Stratton is back in this action-packed, thrilling adventure. When Marisa, an old flame, disappears no one thinks it’s suspicious except Jack and one unbalanced witness. Determined to listen to his instincts, Jack and his feisty sidekick plunge ahead and start tracking down leads, hoping to find Marisa in time. 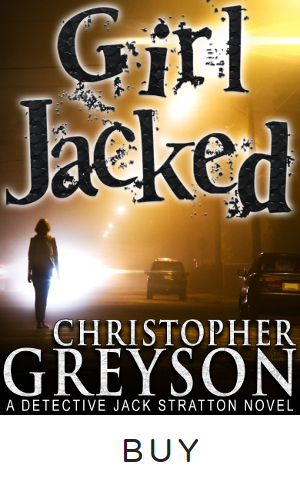 Jack must navigate through assassins and cold-blooded hit men to outwit the cunning kidnappers before it is too late. Stratton is back in another action-packed, thrilling adventure. While recovering from a gunshot wound and the loss of his job on the police force, Jack’s romance with feisty Alice (aka Replacement) continues to develop. When Alice gets a seemingly harmless private investigation job—locate the owner of a lost dog—Jack grudgingly assists. Little do they know it will place them both in the crosshairs of a merciless serial killer. In this digital age of hackers, spyware, and cyber terrorism—data is more valuable than gold. Thieves plan to steal the keys to the digital kingdom and with this much money at stake, they’ll kill for it. Can Jack and Alice (aka Replacement) stop the pack of ruthless criminals before they can Data Jack? When his mother and the members of her neighborhood book club ask him to catch the “Orange Blossom Cove Bandit,” a small-time thief who’s stealing garden gnomes and peace of mind from their quiet retirement community, how can Jack refuse? The peculiar mystery proves to be more than it appears, and things take a deadly turn. Now, Jack finds it's up to him to stop a crazed killer, save his parents, and win the hand of the girl he loves—but if he survives, will it be Jack who ends up with a broken heart? The Detective Jack Stratton Mystery-Thriller Collection contains four novels from the highly acclaimed, wildly popular series with more than 5,000 five-star reviews by Wall Street Journal bestselling author Christopher Greyson. This set includes four stand alone, bestselling novels: Girl Jacked, Jack Knifed, Jacks are Wild, and Jack and the Giant Killer. Order the Detective Jack Stratton Mystery Thriller Collection and join Jack and Alice and over a million readers in their latest adventure today. Ten years ago, four people were brutally murdered. One girl lived. As the anniversary of the murders approaches, Faith Winters is released from the psychiatric hospital and yanked back to the last spot on earth she wants to be—her hometown where the slayings took place. Wracked by the lingering echoes of survivor’s guilt, Faith spirals into a black hole of alcoholism and wanton self-destruction. Finding no solace at the bottom of a bottle, Faith decides to track down her sister’s killer—and then discovers that she’s the one being hunted. Orphaned and alone, rogue-teen Dean Walker has learned how to take care of himself on the rough city streets. Unjustly wanted by the police, he takes refuge within the shadows of the city. When Dean stumbles upon an old man being mugged, he tries to help—only to discover that the victim is anything but helpless and far more than he appears. Together with three friends, he sets out on an epic quest where only the pure of heart will prevail. In these heartwarming short stories, join Finn and Annie as they investigate their way through murder, arson, theft, embezzlement, and maybe even love, seeking to distinguish between truth and lies, scammers and victims. A MiniMystery series that will touch your heart and leave you craving more! Finnian Church is trying to piece his life back together. After losing his leg serving in the Army, he is starting a new career as an insurance investigator. Joining him is newly hired videographer Annie Summers— a woman who lost her hearing and is trying to make it as a single mother of two. The world might see them as broken and battered souls, but as they come together to solve mysteries, they discover that they make a great team. A man mysteriously murdered in his house. Nothing stolen, and no apparent suspects. It seems like an open-and-shut case, but is it? Was it a simple trip and fall or is someone trying to scam the insurance company? —COMING SOON— A minister is killed in a car crash on an isolated road, and a convicted prostitute is found injured in the passenger seat. What will Finn and Annie uncover about the clergyman’s fateful ride home? —COMING SOON—Recently involved in a car accident, a man now claims that his precious dog, Bun, was injured during the crash, too. Can Finn and Annie solve the case and discover what really happened to Bun?